Types of Art: Masks fashioned from leaf, fiber, cloth, and wood are usually worn with leaf and fiber costumes. The major context is men's initiation. Religion: The creator god of the Bobo is Wuro, who is never physically represented and cannot be described in words. Wuro is responsible for the ordering of all things in the world into pairs, which must always remain balanced. However, man, through his everyday existence, is likely to upset this balance. Thus, the Bobo religious system involves restoring order through a series of offerings. 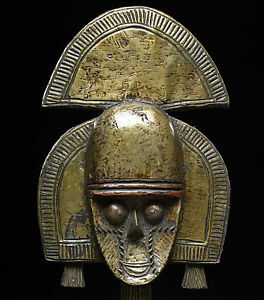 The main god responsible for communication between man and Wuro is Dwo, who is physically revealed through the extensive masking traditions of the Bobo.